Purpose: An organization of Master Guide clubs registered with the Ontario Conference that exists to equip and empower Master Guides (MGs) and Master Guide Trainees (MGTs) in discipling children and youth effectively. Purpose: An executive body in-charge of the oversight of the Master Guide Ministry in the Ontario Conference with emphases on leadership development, discipleship, and evangelism. Accountable to the Master Guide Ministry of the Ontario Conference. To provide leadership training that includes Master Guide Leadership Course and Recertification Program in partnership with the Adventurer and Pathfinder Councils. To assist the Adventurer and Pathfinder Ministries in their discipleship programs. To deploy Master Guides for Disaster Response, community outreach endeavors in collaboration with the Ontario Conference Adventist Community Services and ADRA Canada. The Executive Coordinator is elected by the OCMGC for a term of three years. Be a Seventh-day Adventist church member in regular standing. Uphold the teachings and moral standards of the church in words and deeds. Be an invested Master Guide who has completed the MG Recertification program. Have at least five years of leadership experience in Adventurer or Pathfinder or Master Guide ministry. Be willing to work in collaboration with the Master Guide Ministry of the Ontario Conference. Shall call and chair all OCMGC and Executive Committee meetings. Shall provide input on any matters pertaining to Master Guide Ministry and have a healthy working relationship with the Conference Master Guide Director. Shall present progress reports to the OCMGC, Executive Committee, and the Conference Master Guide Director. May assist with Investiture Services, particularly in welcoming newly invested Master Guides. Is responsible, in collaboration with the Conference Master Guide Director and the Executive Committee, for implementing plans for youth leadership training, evangelism and discipleship. The District Coordinator is elected by the OCMGC for a term of three years. Have at least three years of leadership experience in Adventurer or Pathfinder or Master Guide ministry. Visit each MG club in his/her district at least once per quarter and perform quarterly evaluations. Promote and help in organising MG clubs in churches within his/her territory. Provide input on any matters pertaining to Master Guide Ministry and have a healthy working relationship with the OCMGC Executive Coordinator and Conference Master Guide Director. Present progress reports to the OCMGC Executive Committee and the Conference Master Guide Director. Assist local MG clubs in their MG day programs, consecration, and investiture services, and shall act as the Council/Conference’s representative as needed. Ensure MG club directors under his/her care comply with yearly club registration and insurance requirements, which includes Vulnerable Sector Screening of staff members, as determined by the Ontario Conference. Attend all OCMGC annual sessions and duly called OCMGC Executive Committee meetings. Attend all conference-sponsored MG activities and assist at camporees, campouts, training courses, other MG functions. Ensure Master Guide Trainees (MGTs), who are recommended by the MG club director, have completed satisfactorily their requirements for investiture. Call and chair all District Master Guide Association meetings conducted at least twice a year for fellowship and planning for MG initiatives. The Secretary is elected by the OCMGC for a term of three years. Be an invested Master Guide. Be able to accurately record minutes, have word processing and internet skills and other skills related to duties listed below. Be willing to work in collaboration with the OCMGC Executive Coordinator and Conference Master Guide Director. Shall take and keep minutes of all meetings of the OCMGC and the Executive Committee. Is responsible for sending notices to OCMGC Executive Committee members regarding all meetings in accordance with the OCMGC Terms of Reference, including other meetings called for by the Executive Coordinator. Shall preserve books, papers and documents belonging to the OCMGC. Shall maintain a list of Master Guides in Ontario that includes their basic contact information. The Assistant Secretary is elected by the OCMGC for a term of three years. Qualifications are the same as that of the Secretary’s. In the absence of the Secretary or as assigned, the Assistant will fulfill the duties of the Secretary. The Chaplain is elected by the OCMGC for a term of three years. Be a Seventh-day Adventist Pastor, upholding the principles and values of the Seventh-day Adventist Church. Be an active supporter of a local Adventurer or Pathfinder or Master Guide club. Demonstrate keen interest in training others for effective youth leadership. Is responsible to provide devotionals for the Executive Committee during its regular meetings. Shall provide spiritual guidance to the Executive Committee on issues relevant to his/her field of expertise. Shall encourage executive officers to fulfill the purpose for which the OCMGC has been organized. The Assistant Chaplain is elected by the OCMGC for a term of three years. Qualifications are the same as that of the Chaplain’s. In the absence of the Chaplain or as assigned, the Assistant will fulfill the duties of the Chaplain. The Club Directors’ Representative is appointed by the OCMGC Executive Committee for a term of one year. He/She is expected to attend all duly called meetings and shall advise the Executive Committee of relevant issues pertaining to Master Guide ministry in the local church level. Purpose: Headed by the OCMGC District Coordinator, this association will foster healthy working relationships among invested Master Guides and MGTs in the district, who serve in the Adventurer, Pathfinder, and Youth Ministries of the church. Purpose: To provide Master Guide training for youth and young adults (ages 16 and older) to equip them for effective Christian service. Emphasize spiritual and personal growth for a more intimate relationship with Christ. Participate in conference-sponsored Master Guide events. Provide assistance to the Adventurer, Pathfinder, and Youth Ministries of the local church in leadership, discipleship, and outreach endeavors. Organize plans for AY Honor classes. Foster camaraderie among club members through recreational and relationship-building activities. – For Leadership Training – Responsible for planning and coordinating the Master Guide Leadership Course (i.e., MGT program for both the Adventurer and Pathfinder tracks) and AY Honour classes. – For Discipleship – Liaises with the local Adventurer and Pathfinder clubs in mentoring children and teens for vibrant Christian life and service. – For Outreach – Tasked to plan and coordinate outreach/evangelism programs, mission-service projects, and disaster ministry. – For Recreation – Responsible in providing health-promoting and relationship-building activities. Treasurer – Responsible for making an annual budget, collection of dues, and monthly financial reports. Chaplain – Provides spiritual programming for the nurture of members to Christian maturity. * – The MG club will be in-charge of the MGT program. However, the 10-hour BST will still be handled by either the Adventurer or Pathfinder Councils. NOTE: The primary members of the MG club are the MGTs. Not all invested Master Guides are obliged to be members of the MG club except for those who comprise the staff. However, Master Guides serving in either Adventurer or Pathfinder ministries can be invited as presenters for specific seminars or as mentors to MGTs as they fulfill their “Club Involvement” requirements within 12 months. Counsel with the Conference Master Guide Director. The Conference Master Guide Director is responsible for all Master Guide (MG) clubs in the conference. Any invested MG in a local church who sees the need for a MG club should counsel with him before making further plans. Meet with the Pastor and Conference Master Guide Director. The request should come from the church to the Conference MG Director and he should then spend time with the church pastor explaining the ministry of the Master Guide Club and its operation, detailing what assistance the conference is able to give to his church. Should the conference MG director be unable, through circumstances, to arrange such a meeting, then he may delegate the responsibility to the Master Guide Council Executive Coordinator. Present the plan to the Church Board. The Conference MG Director should request the church pastor(s) to present the plan to the church board. It is necessary that the church board authorizes the organization of the Master Guide program. The board should be fully familiar with all the aims, the financial budget necessary, the objectives and concepts of the MG organization, and the role it can play in youth leadership and evangelism within the church. Following this meeting, the intention to form a Master Guide Club should be announced to the church. Send Charter Application to the Ontario Conference. Upon the approval of the organization of a MG Club by the local church board, a completed MG charter application form should be sent to the Conference. Inform the congregation during the worship service. It is important that all church members be informed about the Master Guide Club, its objectives and its program. Someone qualified by experience to speak on behalf of the MG Club should bring this information to the entire church, preferably during the worship hour on Sabbath. It might be the local conference Master Guide Director, Executive Coordinator, the local church pastor, or some other qualified conference worker who is invited by the pastor as a guest speaker. At this time a call should be made for those invested Master Guides in the congregation to assist and support the Master Guide Club; this is also the time to advertise the MG enrollment and organizational meeting to be convened by the MG District Coordinator. Call a special enrollment and organizational meeting. This special meeting should bring together those who will be involved in the organization of a Master Guide Club. During this special meeting more details in regard to the MG organization could be explained. In addition, membership application, medical info and liability release forms should be distributed to and filled out by potential members. Elect MG Club Executive Officers. Send Yearly MG Club Registration Form to the Conference. Upon completion of the enrolment of members and election of officers, the newly elected club director should submit a completed MG club registration form to the Ontario Conference with the required annual registration and insurance fees. In acknowledgment of the club registration, a certificate of operation will be sent by the conference together with a copy of the insurance policy. MG Staff to attend MG Basic Staff Training and Master Guide Recertification Course. Club officers are required to attend a Master Guide Basic Staff Training before operating a Master Guide Club. Also, they are to undergo a Master Guide Recertification Course to be led by the MG District Coordinator. This is to keep everybody abreast of the new trends in youth ministry and to sharpen each one’s skills for effective Master Guide Ministry in the local church. Call MG Club Staff to plan a Yearly Program. Now that the MG Club officers have been trained and are familiar with the objectives of the Master Guide Club, they should begin to plan for the yearly program. A timetable of events, honor classwork, meeting times, special days, conference events, monthly programs, camping or hiking trips, and camporees should all be included. Plan for a Consecration Service. 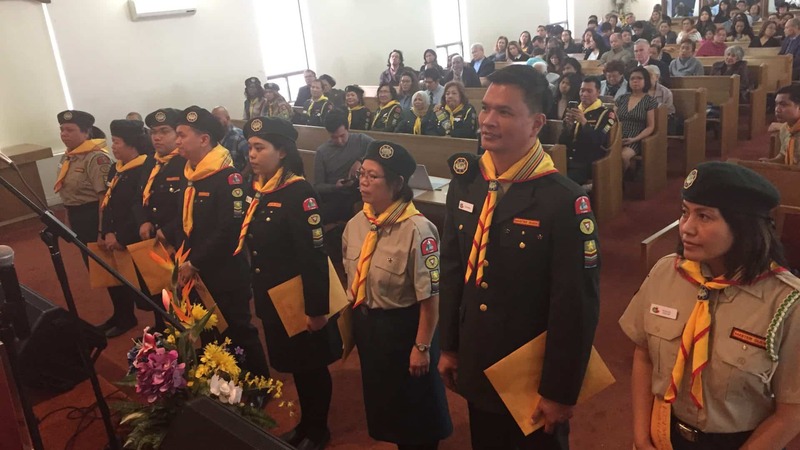 As soon as the new members are in uniform and the Certificate of Operation has been received from the conference office, a consecration service should be organized with family and church members in attendance. All new Master Guide Trainees (MGTs) will be inducted at this service. Once the club has been in operation 10 or 12 weeks, the Conference MG Director and/or MG Executive Coordinator, together with the district coordinator, should be called in to meet with the MG Club Staff to evaluate the club to ensure smooth operation and balanced programming.